Turtle Cups are a fun variation on the traditional Turtle candy made of pecans, caramel and chocolate. Although this version doesn't have the whimsical turtle shape, I think it's more elegant and easier to serve and eat. Arrange the candy cups on a baking sheet. Distribute the chopped pecans evenly among the candy cups. Place the unwrapped caramels and the cream in a medium microwave-safe bowl. Spoon the caramel over the nuts in the candy cups. Be sure to leave a space at the top so that you can fill it with chocolate later. Place the chocolate chips in a small microwave-safe bowl and microwave for one minute, then stir until all of the chocolate is melted. Spoon a small dollop of chocolate on top of the caramel in each cup, making a swirling motion in the center for a finishing touch. 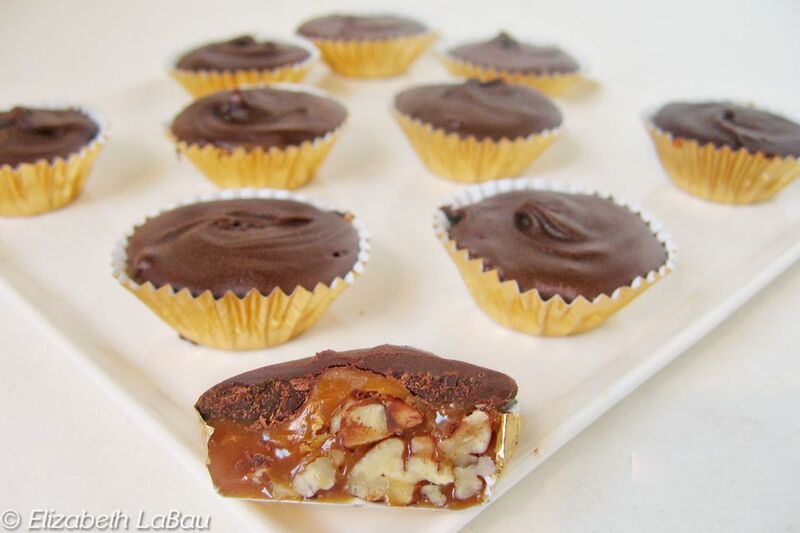 Place the cups in the refrigerator to set the chocolate and caramel, for at least 30 minutes. Unless your environment is very cool, these cups will need to be stored in an airtight container in the refrigerator, as the caramel and chocolate get very soft when left for long periods of time at room temperature.